Norbuprenorphine is a major active metabolite of the opioid modulator buprenorphine. 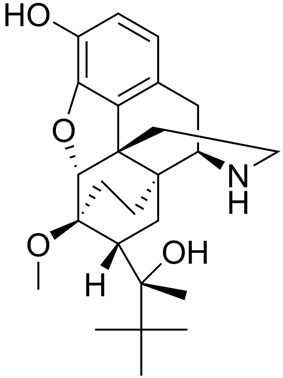 It is a μ-opioid, δ-opioid, and nociceptin receptor full agonist, and a κ-opioid receptor partial agonist. In rats, unlike buprenorphine, norbuprenorphine produces marked respiratory depression but with very little antinociceptive effect. In explanation of these properties, norbuprenorphine has been found to be a high affinity P-glycoprotein substrate, and in accordance, shows very limited blood-brain-barrier penetration. ^ Yassen A, Kan J, Olofsen E, Suidgeest E, Dahan A, Danhof M (May 2007). "Pharmacokinetic-pharmacodynamic modeling of the respiratory depressant effect of norbuprenorphine in rats". The Journal of Pharmacology and Experimental Therapeutics 321 (2): 598–607. ^ a b Huang P, Kehner GB, Cowan A, Liu-Chen LY (May 2001). "Comparison of pharmacological activities of buprenorphine and norbuprenorphine: norbuprenorphine is a potent opioid agonist". The Journal of Pharmacology and Experimental Therapeutics 297 (2): 688–95. ^ a b Brown SM, Campbell SD, Crafford A, Regina KJ, Holtzman MJ, Kharasch ED (October 2012). "P-glycoprotein is a major determinant of norbuprenorphine brain exposure and antinociception". J. Pharmacol. Exp. Ther. 343 (1): 53–61.